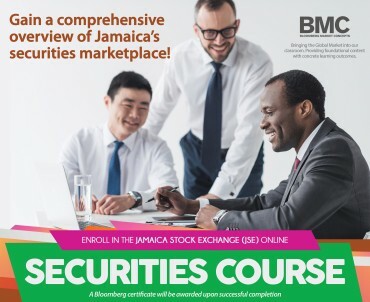 Did you know that the Jamaica Stock Exchange (JSE) e-Campus now offers an Online Securities Course? The JSE through its e-Campus is now offering the foundation Securities Course for persons working in the financial sector and individuals interested in understanding the fundamentals that drive the Financial Services Industry. The Securities Course is considered a must-do for persons working in the financial sector and the JSE, as a leader in the financial sector, has designed an online Securities Course to satisfy the necessary criteria for knowledge, training and certification of professionals in the Industry. The JSE’s instructional course on securities is designed to enhance your understanding and help you successfully maneuver the securities market. Successful completion of the Securities Course is considered to be compulsory because of its many benefits. It helps participants to have a firm grasp of the financial sector, opens doors to careers in brokerage firms, mutual fund companies, banks, financial planning firms, wealth management companies and other providential areas in the financial services industry. The unique feature of the JSE’s Securities Course is that it is offered online and can be accessed from your home, office or any other location where internet service is available. The course is specially designed with you in mind, to allow busy individuals to maximize their time, learn in comfort and study at your convenience, hence the online delivery methodology. The strength of this course comes from its six-week duration as compared to the usual three months of study required by other providers. The JSE’s own market experiences also guided its design of the course to ensure it provides practical, hands-on, and up-to-date knowledge of the industry. The instructors of the course are successful professionals working in the industry who are also expert teachers. As a bonus, you’ll enjoy the community of other individuals who share your goal of financial success through stock trading and investing. *This course has been approved by the Financial Services Commission (FSC) as an approved course of study for meeting academic qualification requirements for registration under the Securities Act as a dealer/investment advisor representative. To register for this course, kindly complete this Online Securities Application Form (fill-able) and submit with a copy of your resume and a valid ID. Why is a Professional Certification Important?